Keystroke Recorder 5.0.1 -Keylogger keyboard recording software utility. Advanced Archive Password Recovery 4.5.3 - Recover passwords to ZIP,ARJ,RAR,ACE archives. PC Repair Doctor 1.1 - Fix Your PC Errors in 2 minutes. Yuvutu Video Downloader 3.18 - Download Yuvutu videos (yuvutu.com) to PC. Quick 3D Cover 2.0.1 - Instant 3d boxshots, CD, DVD, ebooks covers. Hide IP NG 1.53 - Hide IP NG can hide your IP address easily. PC Doc Pro 5 - PC Doc Pro Registry Cleaner- Scan & Optimize. ZIP Password Unlocker 3.0 - Recover WinZIP/ZIP password for you. Advanced ZIP Password Recovery 4.0 - Recovers lost ZIP (PKZip, WinZip) passwords. Norton Internet Security 2010 - Protection from viruses and hackers. Kaspersky Internet Security 2010 - Complete PC Protection. TuneUp Utilities 2009 - A comprehensive, simple &fast PC-Optimization. Password Retriever 1.0 - Retrieve your passwords of Windows. CoffeeCup Website Access Manager 2.0 - Password Protect Your Site Quickly and Easily. Personal Finances Pro 3.8 -Personal Finance application for home users. Cyberduck for Mac 3.2.1 - FTP/SFTP/WebDAV/Cloud Files Browser for Mac. Driver Reviver 3.0.4 - Fix your Computer and Revive your PC Drivers. Absolute Pop Up Maker 2.0 - Create pop up ads that cannot be blocked. Ardamax Keylogger 3.1 - Captures ALL keystrokes typed. AVG Free 9.0 2010 - Free anti-virus protection tool, AVG Free 9.0. SAM Broadcaster 4.6.0 - SAM Broadcaster - Internet broadcast DJ tool. Apple Safari 4 - Fastest, easiest web browser for Mac and PC. Website Extractor 9.30 - Use one of the fastest known offline browser. Edraw Network Diagrammer 5.0 - A professional network diagramming software. Fast Blog Finder 2.6 - A blog commenting software to get backlinks. Backlinks Checker Tool 2.0.1.5 - Download websites backlinks analyzer software. Picture Motion Browser SONY PMB 3 - Sony PMB to play back AVCHD(m2ts) video files. Daemon Tools Pro 4.35.0306 - Create images and DVD Burner software for you. Daemon Tools Lite 4.30.4 - A software to work with image files. OSS Internet Speed Booster 4.5 - Boosts and optimizes the Internet connection. Convert Flash to iPhone (SWF to iPhone) with excellent quality. Besides converting Flash to iPhone MP4, it can also convert Flash audio to MP3, M4A, and AAC files for playback on your iPhone and various audio players. Wondershare Xbox 360 Slideshow is a fantastic photo movie maker for Xbox 360. The Xbox 360 Slideshow is able to add photo/video files and edit them easily with lots of cool effects to make a professional slideshow. Allow you to convert multimedia files to PS3 movie, PSP video format MPEG-4/ AVC with real high-quality which could be played on PS3 and PSP. In addition, it supports the output files as definition 480p/720p and 1080p. Convert DVD Movie to MPEG-1, MPEG-2, MPEG-4, WMV, AVI, MPEG, XVid, DivX. dvdXsoft DVD Ripper features high converting speed and excellent output video quality. Convert personal photos and music files to a movie which can be supported by iPod. You will need to select only your music, photos and output path for your movie. It enables to record streaming video and audio streams in formats like .PLS, .M3U, .ASF, . ASX, . WMA, .WMV, .WPL, .WAX, .WVX. and .WMX by the following protocols: HTTP, Windows Media's RTSP, and MMS. Its user interface is easy to navigate. An extremely easy-to-use DVD/Video to iphone converter. The software makes the process of converting DVD Movie, MTV, Music Video and TV Show to Apple iPhone MP4 or H.264 Video, iPod and Apple TV movie format very fast and easily. High fidelity CDA/MP3/WMA/AVI//WMV Audio/Video encoder and decoder for Windows 2000, XP or higher, with integrated CD-Grabber, supports MP3 from 8Kbps to 320Kbps and WMA9 from 4Kbps to 768Kbps, 100KHz, 24-bit. Batch Video Converter - batch convert AVI, MPG, MOV, QT, WMV, ASF, DAT, VOB, RMVB, RM, MP4, MKV, OGM format video file. You don't have to figure out the purpose of many different buttons. MovKit Batch Video Converter features a simple interface of some buttons that is clear to everyone. Help you create divx wmv avi mpg vcd svcd dvd mp4 3gp mp3 video/audio clips from DVD, VCD, MPEG, AVI, WMV, ASF, MOV, QT, MP4, QuickTime, RM, RMVB, RealVideo and help you play DVD, VCD, MPEG, AVI, WMV, ASF, MP3, WMA, WAV, MOV, QT, MID, RMI files. 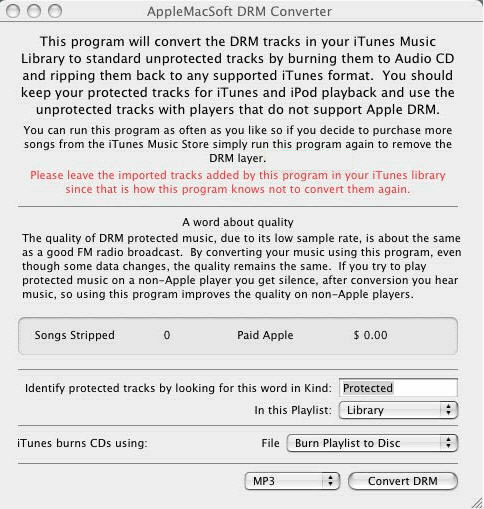 Allow you to change the key of any audio track and save the modified song as an MP3 or WAV file. If you use backing tracks you can now change the key to suit your vocal range at the press of a button! Convert movie files to DVD, VCD or SVCD. It is compatible with most movie file formats including AVI, DivX®, XviD, MPEG1, MPEG2, QuickTime®, ASF, WMV and XP Media Center files. Help you rip DVD movie to Zune MP4, convert DVD to Zune MPEG-4 and WMV video, with excellent image and sound quality. It also supports rip and convert DVD to Zune MP3, WMA, AAC importing to Zune Player. It not only playback MPEG4 videos but also play other container formats like MP4/AVI/3GP/MKV, as well as audio tracks encoded in MPEG-1 Layer 2, Ogg, AAC or AMR. The software is also compatible with Nero Digital, DivX and XviD. Enable you to convert AVI (DivX, XviD...), WMV/ASF, MOV (QuickTime), MPEG (MPEG-1, MPEG-2), MPG, WMA, DAT, MP4, 3GP…to 3GP PSP iPod MP4 formats and support convert Video to iPod Video to 3GP, Video to PSP, video to MP4. It supports nearly all video formats including the following: DivX, XviD, MOV, RM, RMVB, MPEG, VOB, VCD, DVD, SVCD, ASF, QT, WMV, AVI to iPod MP4, PSP MP4, Cell Phone 3GP, Pocket PC files. Ultra Video Joiner is a tool to help you join or merge AVI(Divx, XviD, MPEG4), MPEG I/II, DVD(.VOB), VCD(.DAT), ASF/ WMV files in one large file in various format. This software is very easy to use, and performs quickly without any quality loss. Perform fast video trimming tasks without any quality loss. It has intuitive user-friendly interface and allows splitting a video file in few mouse clicks. Very easy! It supports any AVI file format with any video and audio content. 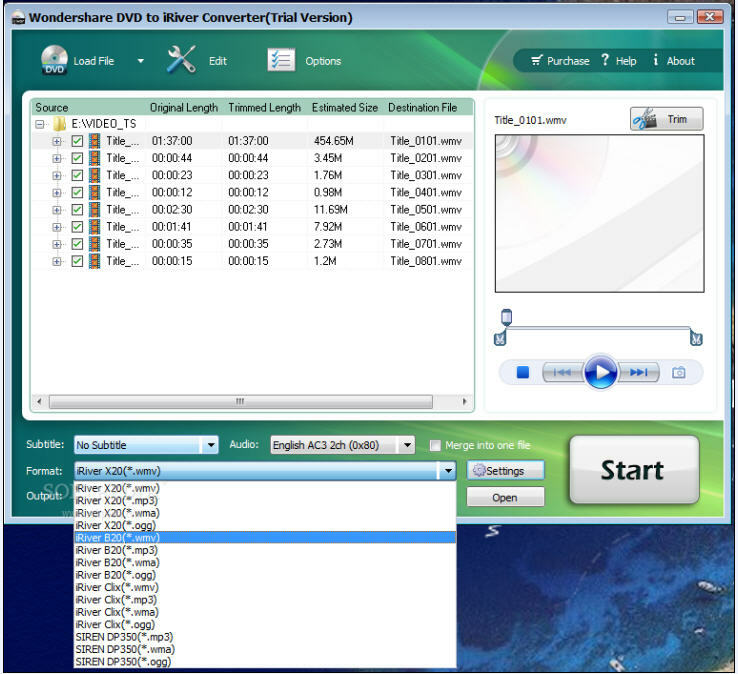 Wondershare DVD to iRiver Converter is a professional DVD to iRiver conversion program that converts DVD to iRiver WMV and iRiver audio formats including MP3, WMA and OGG. It accepts a wide range of video formats - 3GPP, 3GPP2, ASF, AVI, DAT (VCD), DivX, DV, MKV, MOV, MP4, MPEG-1, OGM, RAM, WMV and Xvid, and output to Wii compatible QuickTime movie files.